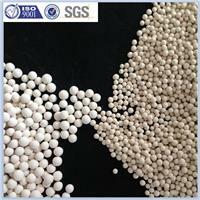 4A Molecular Sieve is an alkali alumino silicate; it is the sodium form of the Type A crystal structure. 4A molecular sieve has an effective pore opening of about 4 angstroms (0.4nm). 4A Molecular Sieve is an alkali alumino silicate; 4A Molecular Sieve is the sodium form of the Type A crystal structure. 4A molecular sieve has an effective pore opening of about 4 angstroms (0.4nm). 4A molecular sieve will adsorb most molecules with a kinetic diameter of less than 4 angstroms and exclude those larger. 4A Molecular sieve can adsorb molecules include simple gas molecules such as oxygen, nitrogen, carbon dioxyde and straight chain hydrocarbons. Branched chain hydrocarbons and aromatics are excluded. Drying and removing of CO2 from natural gas, LPG, air, inert and athmospheric gases, etc. Special types are used in the air break units of buses, trucks and locomotives. Packed in small bags, it may be used simply as a packaging desiccant. Naike 4A molecular sieve can be regenerated by either heating in the case of thermal swing processes; or by lowering the pressure in the case of pressure swing processes. 4A molecular sieve are available in beads of 1-2 mm, (10x18 mesh) 2-3 mm, (8x12 mesh) , 2.5-5 mm, (4x8 mesh) and as powder, and in pellet 1.6”, 3.2”.